Ofcom has just launched their annual communications report, which is probably one of the most important pieces of annual research in the UK market. In the report this year we see the first signs of VoIP becoming an accepted medium with both strong demonstration of business and consumer usage. In their survey they state that 17% of adults say they are currently using (VoIP) services. Also we saw significant erosion of traditional business voice revenues, and the clear indication that these were switching to VoIP revenues. We also saw significant decline in traditional fixed voice calls and revenues, with business calls falling by 4.5%. This was also demonstrated in a overal fall of 3.1% in fixed voice revenues. Both these figures showed an acceleration in decline seen in previous years. Also we saw a dramatic decline in the number of analogue lines deployed with this figure falling to 4.8 million, a year on year decline of 5.6%. All these figures and statements indicate that during this recession we are starting to see a real growth in the impact of VoIP services against the traditional market. With potentially SIP trunking starting to erode ISDN and Hosted VoIP attack some of the traditional lines and call so prevalent in the SME market. In the coming days we will look to analyse the figures more deeply, but for the first time Ofcom are really recognising the potential impact of VoIP on the market. For more detail of the report please goto http://stakeholders.ofcom.org.uk/market-data-research/market-data/communications-market-reports/cmr10/. As Daisy reports strong financials for the last 15 months with revenue of £134 million and Ebitda of £11million, it is clear that the real opportunity is potentially in cross selling services to their existing base with 46% of their customers only currently buying one product. Also in the last weeks I have been hearing more about there increased focus on VoIP products with the appointment of Chris Jagussz as director for voice and data services as of the 1st July, and Andrew Goldwater taking specific responsibility for their VoIP portfolio. With the experience and platforms they purchased in the BNS acquisition Daisy are position well to take a leading role in the development of the VoIP market. There has been some recent press activtiy in Mobile news etc http://www.mobilenewscwp.co.uk/news/daisy-grows-uc-with-voip, and the Voiceofvoip are scheduled to meet Chris and Andrew shortly. We will keep you posted on Daisy Developmnets but we expect to see them have sigificant impact on the VoIP market. 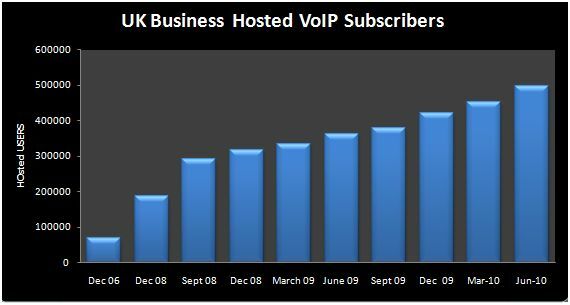 In the second quarter of 2010 we saw increased growth in the Business Hosted VoIP market with the total number of seats deployed reaching 499744. This represented a quarter on quarter growth of 10%, which demonstrates an increase on recent quarters. Interestingly there was steady growth across most of the players in the market with a few significant large deployments that gave the market a boost. Generally the mood amongst the players seemed relatively upbeat with them benefiting from businesses requiring increased productivity & flexibility.